Unusual for me I know. I usually try to post either finished tutorials or finished minis but in the interest of trying to keep people interested I'm trying to post a little more regularly. I've four guys actively on the go at the moment, that is in the crosshairs and actively receiving paint. three of my GK conversions and one model for a freind. The GK are giving my a slight issue. I'm taking more time over them than the first two, and working hard to improve the paint, as I have the modelling too. and while I am very happy with the way they are going... they are a smidge darker than the other two. I think I'll live with it, but I know it's going to bug me a little every time I look at them. they still need a whole heap of detail and highlight, but i'm pleased so far with the grey, the glds etc. I think the eyes really pop, and the darker tone does a nice job of draing you to the BC's face. still cant quite get the smoothness I want though. There we are, WiPs galore. I hope to have these guys finished by the end of the weekend (the GK at least) but work is going crazy at the moment, so don't count on it. Great looking terminators and Grey Knights. I think your method gives a great vibe of the kind of pre-heresy armour that has probably been passed down through generations of Daemonhunters. I love the fact that your GKs are recycled terminators and all have such unique poses. So much more character than the off-the-shelf metals (which I do quite like). This unit, and army, is going to look amazing when complete - I look forward to seeing them en masse! Pete, that's pretty much exactly the idea. 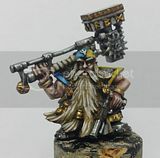 my whole army is intended to be the contents / crew of a ship of some kind who went "out there" a very long time ago, meaning that some compromises on equipment have been made, - most people are supposed to look grizzled and "veteran" and once I decided to include GK is thought i'd have them a bit different too. old Armour, maintained not exactly as well as it could be, patched with normal TDA pieces in places and not dripping in pomp, but practical and well used. These guys look great, especially that Borther-Captain, very nice!